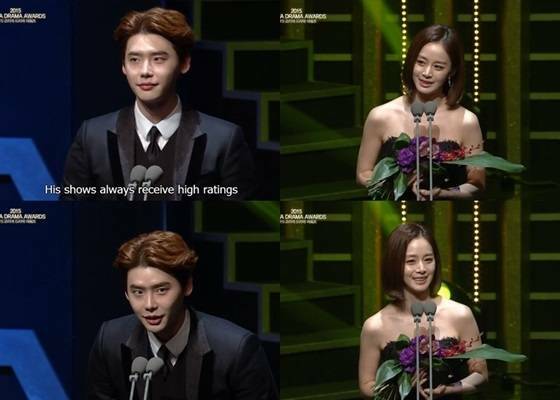 Lee Jong-suk and Kim Tae-hee received Top Excellence Award, Actor and Top Excellence Award, Actress respectively at 2015 Korea Drama Awards (KDA). Lee Jong-suk and Kim Tae-hee won Top Excellence Award, Actor and Top Excellence Award, Actress for the roles in 'SBS' "Pinocchio" and SBS' "Yong Pal" respectively at 2015 Korea Drama Awards, which took place in Gyeongnam Province Cultural Center, Jinju, Gyeongnam Provinc on October 9th. Lee Jong-suk said during the acceptance speech, "I'm happy to receive the award. I am thankful". Kim Tae-hee also said, "I'm so happy and nervous because I get to receive an award in a long time. I'd like to share this honor with our staff members who worked hard day and night on the field". The award ceremony was emceed by entertainer Oh Sang-jin and Girls' Generation Choi Soo-young. The event is Korea's largest drama award ceremony in terms of a single genre: dramas, including alll the dramas broadcast for the year through the three groundwave broadcasting companies, general service channels, cable channels and online platforms. Winners have been selected for 18 categories in total including Grand Prize, Top Excellence Award, Best drama, Best Screenplay. Ryu Soo-young, "Recent purchase of condo in Bangbae-dong is unrelated to Park Ha-sun"